Janet's Planet | Where we're moving at the speed of thought! :) | Nikola Tesla, Greatest GEEK/SCIENTIST/INVENTOR EVER! On this day in 1943, Nikola Tesla died at the age of 86, alone and penniless in a New York City hotel. And yet his work is more relevant to how we live today than most people realize. Why Nikola Tesla was the greatest INVENTOR who ever lived and possibly the greatest GEEK who ever lived. Over one hundred years ago a Serbian-American inventor by the name of Nikola Tesla was fixing things that weren’t broken. In a time when the majority of the world was still lit by candles, an electrical system known as alternating current was invented and is what powers every home on the planet. Who do we have to thank for this invention that ushered humanity into a second industrial revolution? Nikola Tesla. Now you might be saying…”But I thought Edison was the father of the electric age?” And the answer is Nope. Nada. TESLA! Most people think that Edison invented the light bulb. Basically Edison improved upon the ideas of 22 other men who pioneered the light bulb before him. Truth is Edison just figured out how to SELL the light bulb. Tesla actually worked for Edison and Edison promised to pay him the modern equivalent of a million dollars to fix the problems Edison was having with his DC generators and motors. Tesla fixed the motors and then asked for his money, and Edison laughed and replied, “Tesla, you don’t understand our American humor.” Edison wasn’t so much a geek but a non-geek working in a geek space. He thought the value of his inventions could be measured in how much money they made. He was neither a scientist or a mathematician, he hired people to do those things. Edison was a CEO, not a Geek Scientist. Tesla was known for discovering amazing things and then FORGETTING TO WRITE THEM DOWN. Edison was known for rushing to the patent office as soon as one of his workers had a brilliant idea. Tesla and Edison had a falling out…little wonder, and thus Tesla went to work on his alternating current electrical system. This infuriated Edison who was trying to sell the world on his direct current system. Edison’s DC current system required a power plant every square mile and couldn’t transmit electricity very far, AC used thinner wires, higher voltages, and could transmit electricity over long distances. Edison retaliated by paying local school boys 25 cents for every dog and cat they could find in Edison’s neighborhood and Edison was electrocuting his neighbor’s pets to show how dangerous TESLA’s AC current was. His goal was to prove that AC current was too dangerous to use in people’s homes. Even Marconi, the guy who won a Nobel Prize in Physics for inventing the radio work was based all on the previous work of TESLA. In truth Edison was…NOT A GOOD GUY! After Marconi became world famous for sending the first transatlantic message, Tesla’s response was: “Marconi is a good fellow. Let him continue. 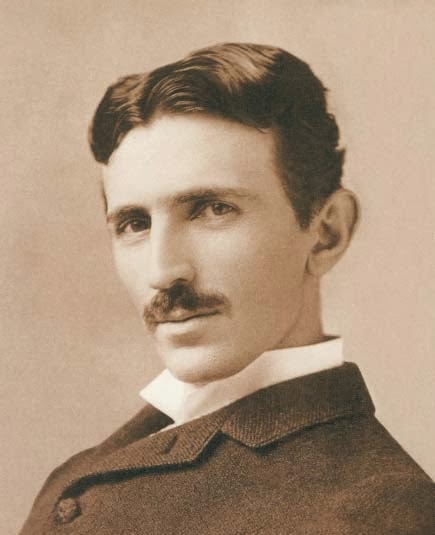 He is using 17 of my patents.” So basically….TESLA = NICEST SCIENTIST/GEEK/INVENTOR EVER! Radar? Credited to Robert Watson Watt in 1935, but Tesla had invented it in 1917 and pitched it to the US Navy. But Edison was head of R and D and told the US Navy that it had no practical use. EDISON IS A SCIENCE BULLY! X-Rays gets credited Wilhelm Rontgen, but totally TESLA. He warned of the potential harm from radiation, but EDISON basically X-Rayed his assistant to death, and nearly X Rayed himself blind. EDISON = RAVING JEALOUS IDIOT! From hydro-electric power to cryogenic engineering, to recording radio waves from outer space, to the transistor to the resonant frequency of Earth to an earthquake machine….ALL TESLA. Remote control, Neon Lighting, the modern electric motor, wireless communications…Spanx, oh wait a minute, everything else I’ve mentioned, but NOT SPANX. TESLA COULD RECITE ENTIRE BOOKS AT WILL. TESLA COULD VISUALIZE SOMETHING IN HIS HEAD AND THEN BUILD IT WITHOUT EVER WRITING ANYTHING DOWN. But he was a tad bit CRAZY. In the end he died penniless and alone and in his last interview talked about loving a pigeon and dining on nothing but Nabisco crackers and milk. It’s a sad and WEIRD story the life of TESLA, but for everything that he did and created, we say THANK YOU NIKOLA TESLA!